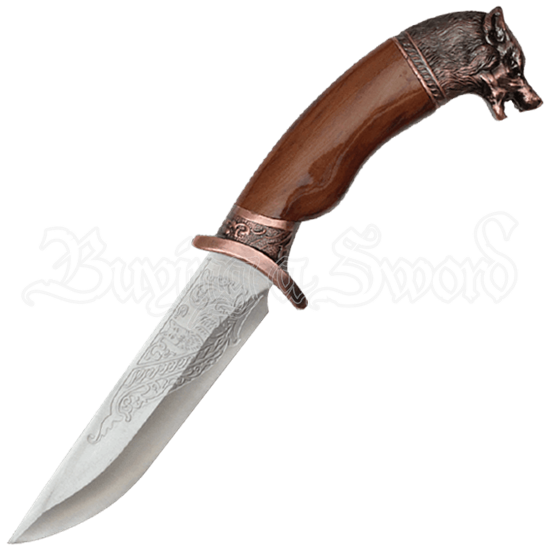 A pair of wild canines completes a hunt under the cover of night in the scene that decorates the scabbard of the Bronze Wolf Dagger. One beast lifts its head to howl at the moon while the other stares bravely at what lies ahead. Vinery and an antique bronze finish contribute to the rustic appeal of the cast metal scabbard. The engraving found on the stainless steel blade of the dagger echoes the same theme. Bronze detail accents the guard and pommel of the brown acrylic handle. A highly detailed cast of a wolf head forms the pommel.